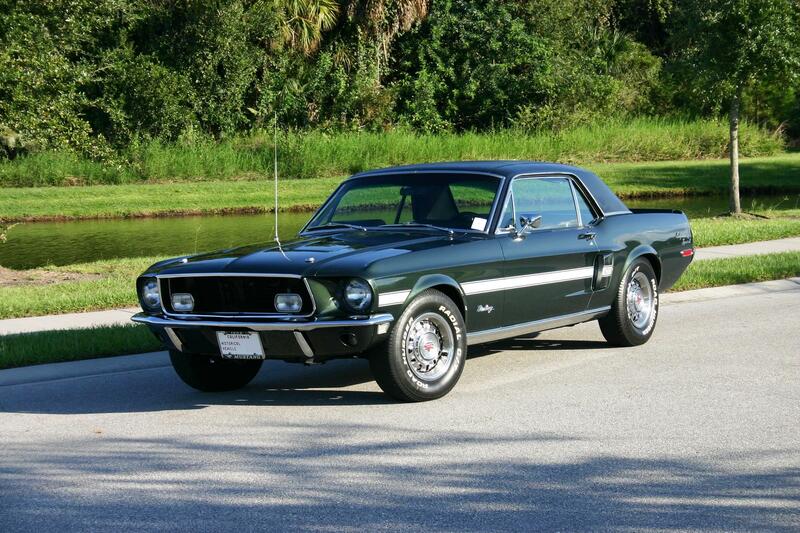 Step on in to this 1968 Mustang hardtop with automatic transmission, air conditioning, and center console. Dash close-up view of a 1968 Mustang hardtop. Under the hood is a newly restored 289 cubic inch, 2 barrel, V8 engine. Close-up view of the full wheel covers and bright rocker panel of a restored Meadowlark Yellow 1968 Mustang hardtop. Sunlit Gold 1968 Mustang Golden Nugget Special hardtop, right side view. Love the combination of the black top, black side stripe, blacked out hood louvers, solid black tires, and black in the Magnum 500 wheels. It has a nice looking black interior with an automatic and center console. Here is the data plate. Gold Nugget Specials have the 74 DSO and 1111 special order number. The Y5 is for the Sunlit Gold Paint (Y) and the blacked out hood (5). Sunlit Gold 1968 Mustang fastback owned by Scott Allan from New Zealand. This is our featured Attitude Of The Week for the week starting September 8, 2013. It has it's original 289ci V8 and an automatic transmission. Scott tells us more, "Imported from Texas in 2005 to New Zealand. Not restored but the usual maintenance and repairs. Colour really lives up to its name in the Sun." Here is Scott's Sunlit Gold 1968 Mustang fastback at a car show in New Zealand. Lime Gold metallic (or Lime Green metallic) 1968 Shelby GT500 Mustang fastback with a 335hp (at 5200rpm), 428 cubic inch, 4 barrel, Cobra Jet V8 engine. Options on this car include: power steering, power brakes, extra cooling package, heavy duty battery, a 3.50 rear axle gear ratio, tilt-away steering wheel, sport deck rear seat, and decor options group. Lime Gold metallic 1968 Shelby GT500 Mustang fastback, right side view. Rear left view of a Lime Gold metallic 1968 Shelby GT500 Mustang fastback. An absolutely beautifully restored 1968 Lime Gold metallic Shelby GT500 Mustang fastback, front right view. Interior view of a 1968 Shelby GT500 Mustang fastback. Dash close-up view of a metallic 1968 Shelby GT500 Mustang fastback. 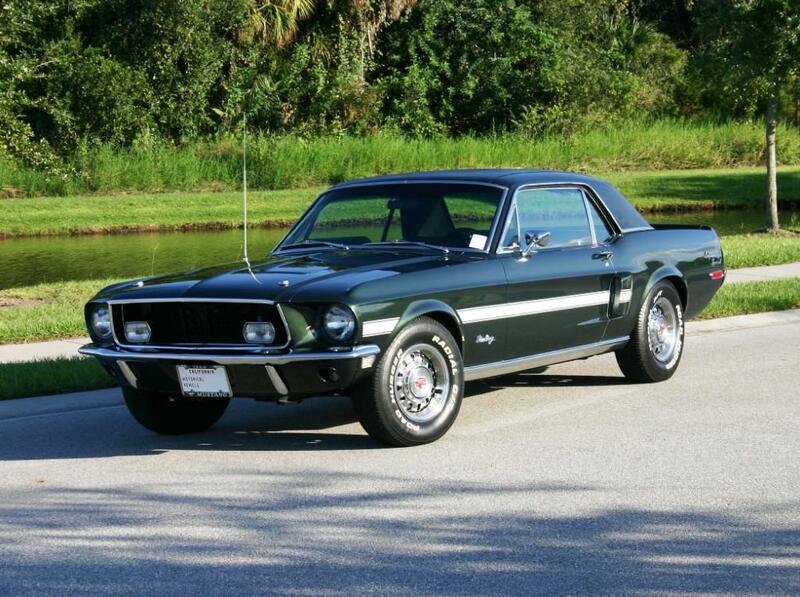 The 1968, Mustang Shelby, R-code, 335hp (at 5200rpm), 428 cubic inch, 4 barrel, Cobra Jet V8 engine. 1968 Ford Mustangs Thumbnail Collection. Page 29 of 68.